Mountain village Strazne in the Giant Moutains is situated 800 m above sea level. Strazne lies 4 km far from Vrchlabi and together with Herlikovice forms one municipality of administration. Strazne spreads between east slope of Zaly ridge and foothill Planina to Lisci mountain. Natural monument Mine Strazne is a former lime mine under the Hribeci chalets, north-east from Srazne on south-west foothill of Svetly hill, about 5 km south of Spindleruv Mlyn. 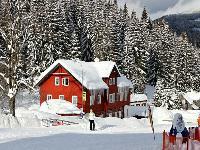 Come to visit village Strazne – one of the most beautiful places in the Giant Mountains.